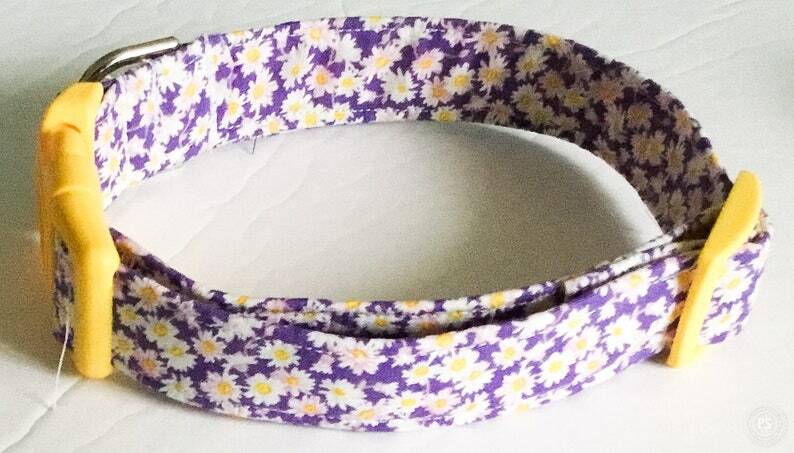 This pretty Purple and Yellow Daisy Girl Dog and Cat Adjustable Collar is nice for Spring and Summer daily casual wear and can be purchased in both a buckled or martingale design. The purple floral collar comes with a plastic colored buckle but can be purchased in silver or gold metal also in the options when ordering. A Rose gold metal buckle is available also. Please follow the personalization link section below to order the rose gold buckle. Engraved buckles are also available under the Personalization and Buckle Upgrades section below.